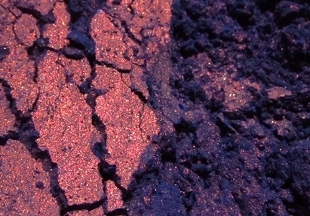 Mephisto is a dark royal blue with a vibrant metallic red sheen that's quite striking when the light hits it. Metallic finish, not sparkly. If the red goes somewhat coppery on application, add a little more. Not recommended over Pixie Epoxy, and for a more even application, try fingertip instead of brush.